Google did well with the last device in its Pixel smartphone realm, the Pixel 3. With consumers saying no to the high prices of smartphones today many are holding onto their devices for longer than ever. The fact that people aren’t buying high-end devices as frequently they used to has led to some nice mid-range phones that are more realistically priced. Google has been rumored to have just such a device in the works with the Pixel 3a. 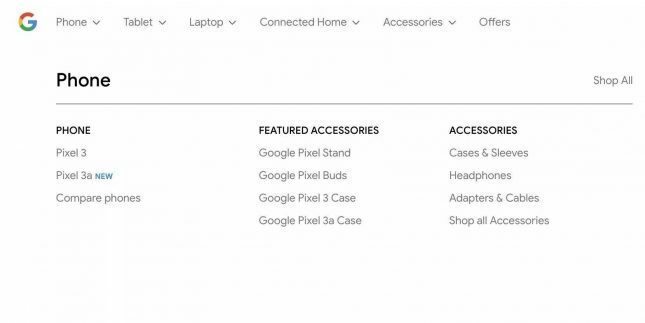 The smartphone has been confirmed, accidentally, by Google with a listing for the Pixel 3a turning up on the official Google store long enough for 9to5Google to grab an image. The website also had a listing for a Google Pixel 3a case as well. Some specs confirmed with the leak include a 5.6-inch OLED screen at 1080 x 2220. The smartphone will have a Snapdragon 670 SoC, 4GB of RAM, and a 12MP rear camera. Power is from a 3,000 mAh battery and the OS out of the box is Android 9 Pie. A larger Pixel 3a XL is expected to use a 6-inch 1080 x 2160 display and 64GB of storage inside. It’s unclear exactly when the phones will launch.